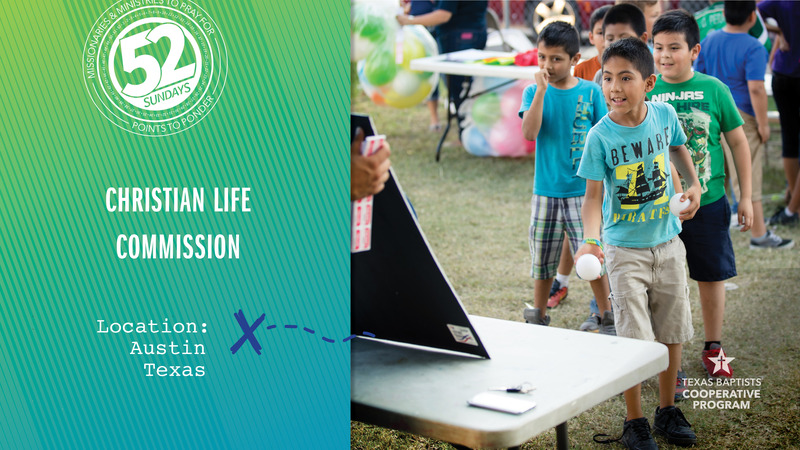 The Christian Life Commission helps churches identify their greatest strengths and their community’s greatest needs so that the body of Christ have the greatest impact possible. Ali Corona, hunger and care ministries specialist with Texas Baptists’ Christian Life Commission, equips churches to serve their communities through resources, visits and trainings. Her work not only helps churches identify their community’s areas of greatest need, but also their own strengths in order for those needs to be addressed. Recently, Ali and her co-workers conducted an interactive training at Iglesia Bautista Vida Nueva in Austin, where church members reflected on their interests, abilities and calling. The church members were also given a list of resources and services that were already available in their area to be aware of potential partnerships and avoid replicating services. Our church’s gifts through the Cooperative Program help fund Ali’s position with the CLC, enabling her to help churches minister to their communities. Let’s pray for Ali and Iglesia Bautista Vida Nueva and other churches who are seeking to be the hands and feet of Jesus to their neighbors.